Following what Compton called the “causal chain,” it’s possible to get to the “causes of the causes” of social determinants of health; in other words, not just what an illness is, but why it happened. Take, for example, Jason, a young boy. Jason, Compton said, is in the hospital. Why is he in the hospital? Because he has a bad infection from a cut on his leg. Why does he have a cut on his leg? Because he was playing in a junkyard next to his apartment and he fell on some jagged metal. Why was he playing in a junkyard? His neighborhood is run down, kids play there, and there’s no one to supervise them. Why does he live in that neighborhood? His parents can’t afford a nicer place to live; his dad is unemployed, and his mom is sick. Why is his dad unemployed? He doesn’t have much education. By exploring these underpinnings, Compton believes it’s possible to effect change. He identified nine core social determinants of health: adverse early life experiences; poor education and educational inequality; job insecurity, underemployment, and unemployment; income inequality and poverty; food insecurity; poor housing quality, housing instability, and homelessness; adverse features of the built environment, or the surroundings and infrastructure, such as buildings, parks, and water supply, that mold human activity; and poor access to health care. All nine, he said, directly impact health. Compton divided potential preventive strategies into three categories: clinical interventions, such as screenings, resource guides, and referrals to aid programs; partnerships, like medical-legal partnerships where a civil attorney is part of the clinical team and can help with evictions, for example; and policy interventions. 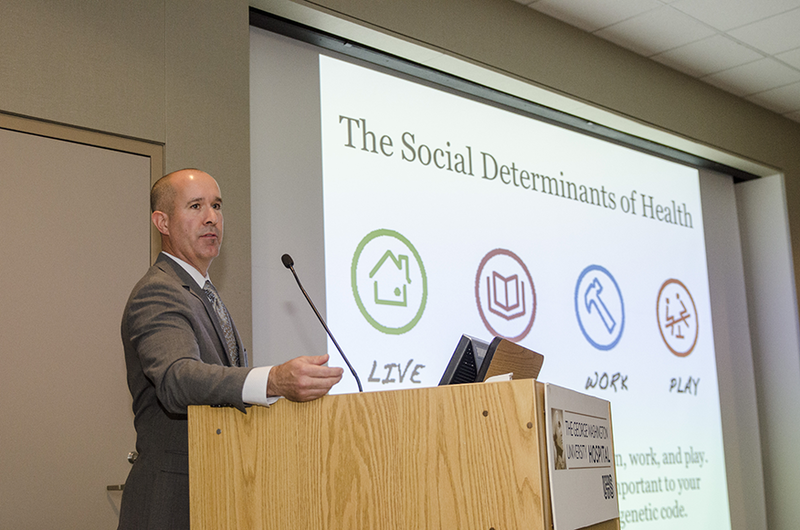 Improving the social determinants of health, he added, is a moral and ethical imperative.